In 2017, the North Dakota Fighting Hawks came to Missoula as defending Big Sky Champions, and with one of the strongest run games in the country and a defense to match, was picked to make another run at the league title. But before they arrived at UM, UND suffered a rash of injuries that put the brakes on their playoff ambitions, as the Griz pounced all over them for a 41-17 win on homecoming. Now under head coach Bobby Hauck, the new-look Grizzlies are set to travel to Grand Forks for the first time since 2014 for a pivotal matchup against a healthy Fighting Hawks team, still loaded with much of that talent that won a league title two years ago. 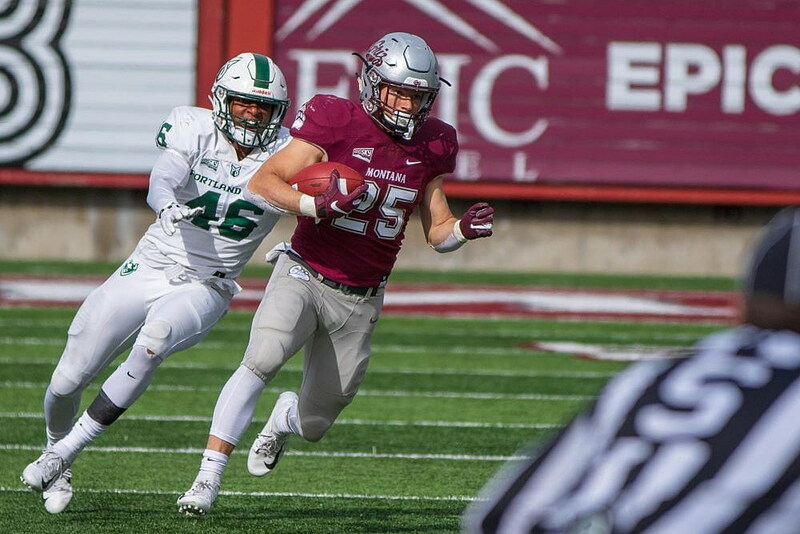 Led by All-Americans John Santiago at running back and Deion Harris at safety, the (old) new-look Hawks will pose a formidable challenge for the Griz as they look to rebound from a tough loss to Portland State. “It’s a big week for us certainly, having to come off a loss at home and to go on the road to get a win,” said Hauck, who sees the loss as a learning opportunity for his young squad. THE GAME: The Grizzlies are set to face the Fighting Hawks on Saturday, Oct. 13 at Noon (MT), 1 p.m. (CT) at the Alerus Center (12,283) in Grand Forks – the first of two indoor games on UMs schedule this season. For Montana (4-2, 2-1 BSC), the contest holds important Big Sky and post-season implications as the Grizzlies look to return to the FCS playoffs for the first time in three years, but the same can’t be said for North Dakota (3-2). Since UND announced its transition out of the Big Sky Conference and into the Missouri Valley Football Conference in 2020, the Fighting Hawks are now considered an Independent FCS program, making them ineligible for a Big Sky championship. While UND can’t win a Big Sky title, they can play the spoiler with the game in Grand Forks counting toward UM’s league tally because the games were already scheduled long before the announcement. Despite all that, following their first conference loss last week the Griz know the Hawks are an opponent not to sleep on, even though they no longer show up in the league standings. WATCH: The Montana/North Dakota game will be broadcast over the air and on cable systems statewide on your local FOX Montana station (except in Billings where the game will be seen on SWX, channel 8.2 and Spectrum channel 503). Looking ahead, the UC Davis at Montana game will be the final contest of the year on Cowles Montana Media stations and will be broadcast statewide on ABC Montana while streaming on PlutoTV channel 237. HAPPENINGS: Montana and North Dakota will join in solidarity this weekend in Grand Forks to “Set the Expectation,” with both the Grizzlies and Fighting Hawks donning purple and teal ribbon helmet stickers in a show of support in the fight against sexual assault. UM director of athletics Kent Haslam and UND director of athletics Bill Chaves will join assault survivor and awareness advocate Brenda Tracy in an on-field recognition of both school’s commitment to “set the expectation” that sexual assault and physical violence are never okay. RANKINGS: As expected, Montana’s loss to Portland State cost them in the national rankings, but the Griz have done enough during the first half of the season for voters to keep them in both polls. UM came in at No. 22 in the STATS FCS (down from 14) and No. 23 in the AFCA FCS Coaches’ Poll (down from 15). With two losses, Montana will need to solidify its resume over the remaining five games to ensure a spot in the playoffs. SERIES HISTORY: Montana holds a 15-8-1 all-time advantage over North Dakota dating back to the first meeting between the two schools in 1915, a 10-10 tie in Grand Forks. Including that draw, UM holds a 6-4-1 over UND in North Dakota and is 2-2 all-time in neutral site games played in Billings in the early part of the last century. In the modern era, Montana holds a 5-1 advantage dating back to 2010, and never lost to the UND in the years they were part of the Big Sky (2013-18). LAST MEETING AT UM: The Grizzlies racked up 604 yards of total offense and five touchdowns while the defense held the Fighting Hawks to just three first-half points to come away with a dominating 41-7 on homecoming in Missoula in 2017. Keenan Curran hauled in a pair of touchdown grabs, Samori Toure picked up another, and Alijah Lee also scored on the ground for UM while Josh Buss had a huge day defensively with 14 tackles, a TFL, a half-sack, and a pass breakup. LAST MEETING AT UND: Due to an unbalanced Big Sky schedule, the Grizzlies have not played in Grand Forks since 2014, where Daniel Sullivan nailed a 35-yard field goal with 1:03 on the clock – the last game-winning field goal kicked by any grizzly – to come away with an 18-15 win at the Alerus Center. The No. 7 Griz ran out to a 15-0 lead over three quarters with a safety from Zack Wagenmann and a pair of touchdowns from current BC Lion Travon Van. But upset-minded UND scored 15 unanswered points in the fourth quarter, and Robert Luke blocked what would have been a 40-yard game-winning field goal for the home team to set up Sullivan’s heroics. DANTE’S INFERNO / TOP TACKLERS: We’re starting to run out of superlatives for Dante Olson. One week after posting the second-most tackles of any college football player in the nation (at any level), Olson was dominant once again against Portland State, racking up 19 tackles, two TFLs, and two forced fumbles. Both his 24 tackles at Cal Poly and his 19 against PSU rank among the 10-best single-game performances in UM history. Olson is now the national leader (at any level) in tackles with 98 on the season, averaging a national-best 16.3 per game. He needs just 33 more tackles over the next five games to break Kendrick Van Ackeren’s 130 tackles in a season, and 79 more to break J.C. Sherritt’s Big Sky Conference record. LIKE UNCLE, LIKE NEPHEW: Tim Hauck remains UM’s second all-time leading tackler (tied with Colt Anderson) with 129 takedowns in a season and 305 on his career. Freshman safety Robby Hauck (Tim’s nephew and coach Hauck’s son) is quickly catching up to his uncle, however. With 59 total, Hauck is the second-leading tackler (behind Olson) in the Big Sky and is ranked No. 22 in the nation in total takedowns, averaging 9.7 per game. Hauck is one of only three freshmen among the Nation’s top-25 tacklers, and will likely be in the conversation for the Jerry Rice Award for the nation’s top freshman. Other top freshman tacklers around the nation this week: Jarrett Nagy, Presbyterian, LB (9.8 TPG) and Chris Kolarevic, UNI, LB (10.8 TPG). BUSS’ STOPS: With 11 tackles against Portland State, Josh Buss moved up to No. 25 on UM’s all-time tackles list, tied with Dan Downs and Kurt Schilling with 241 career takedowns. He needs just 10 more tackles to move to No. 23, passing Mike Bouchee at 245 and Trey Young at 250. In addition to being two of UM’s top tacklers, Buss and Olson lead the Big Sky and are tied at No. 8 nationally in forced fumbles with .5 per game. Buss is also tied with Reid Miller at No. 3 in the nation in fumble recoveries with two on the season. KICKING ACES: Tim Semenza is now one of only eight kickers in the nation to remain perfect on the year after not taking a FG attempt against PSU. Of those eight, three are in the Big Sky. EWU’s Roldan Alcobendas and Cal Poly’s Alex Vega are all 100 percent this season. Semenza has the eighth-most field goals-per-game in the nation, averaging 1.67 per game. While not 100 percent, Weber State’s Trey Tuttle is the nation’s leader in FGs/game, averaging exactly 2. RARE RETURNS: After another solid performance as a kick return specialist, freshman Malik Flowers is now the No. 2 returner in the nation with a combined yard total of 485. SCOUTING THE HAWKS: North Dakota Head coach Bubba Schweigert is in his fifth season in Grand Forks and has the Hawks running – literally. UND has the No. 14 rushing offense in the entire country with 1,258 yards on the ground so far this season thanks mostly to a pair of all-everything senior tailbacks in Santiago and Brady Oliveria. Oliveria is coming off his 10th career 100-yard rushing performance at Northern Colorado two weeks ago before the Fighting Hawks rested up on a bye week. The senior went for 123 total yards and a pair of TDs against the Bears, UND’s fifth 100-yard rushing performance of the season. Santiago is currently the No. 3 rusher in UND history with 3,447 career yards, and No. 6 on their career rushing TD list with 28. Not afraid of a big game, Santiago rushed for 139 yards at Washington in a 45-3 loss for the Hawks. The UND offense will be guided by former Sac State quarterback Nate Ketteringham who has thrown for 857 yards and six TDs so far this season. During his time as a Hornet, Ketteringham threw for 3,391 yards and 24 TDs in two seasons in Sacramento. Defensively the Hawks pose even greater problems, ranked No. 3 in the nation in team sacks and No. 5 in the nation in team TFLs. Junior end Mason Bennett has logged 6.5 sacks this season, the third-most in FCS football, to lead the Hawks QB rush attack, while senior linebacker Tanner Palmborg returns to the team after receiving All-Big Sky honors as a junior along with nose tackle Tank Harris. UND’s secondary welcomed back R-Sr. cornerback Deion Harris this season after missing all of 2017 in the Hawk’s rash of injuries. Before being hurt, Harris was a second-team All-American and first-team All-Big Sky performer with 36 tackles and a league-best five interceptions. UP NEXT: After a much-needed bye week, Montana returns home to face its second-highest ranked opponent of the season when the potent offense of Coach Dan Hawkins’ No. 14 ranked UC Davis Aggies comes to Missoula on Oct. 27 for Military Appreciation Day.